About 1.5 miles up Preston Creek Road. Stormy Mountain coming into view. 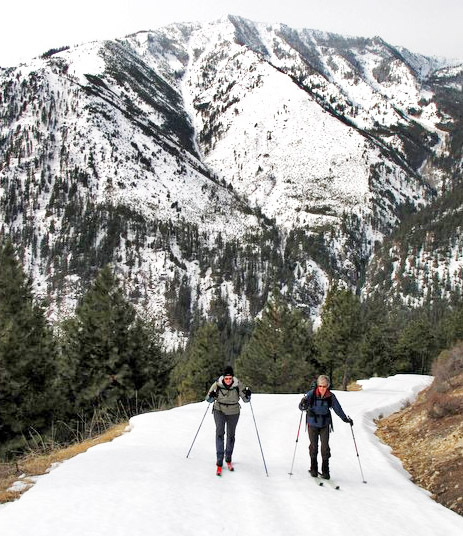 “Why have so many people given up on this type of cross-country skiing?” I ask Matt Dahlgreen as we stride up the Preston Creek Road above the Entiat River. It’s a bluebird day in mid-March, the sun is warm on our shirts, the snow underfoot is transitioning from an early morning crust into corn, it’s absolutely silent outdoors, and the views across the Entiat Valley are Switzerland gorgeous. “I mean, why would you choose to spend sizable chunk of change to ski around in circles on a groomed track with loads of other people when you can be alone and ski miles of road for nothing?” I say, popping the camera up to capture yet another big-scenery image. Tyee Mountain, rising precipitously from the far side of the Entiat Valley, provides a dramatic backdrop for sking the Preston Creek Road. Like me, Matt doesn’t ‘get it’ but we brainstorm possibilities. “Technique.” Maybe groomed skiing allows people to work on their skating and that technical challenge trumps the aesthetics of the experience. “Safety.” Even though following a snowed-over road is low on the danger scale, maybe the sanitized risk of a groomed trail system speaks to percentage of the Nordic population. 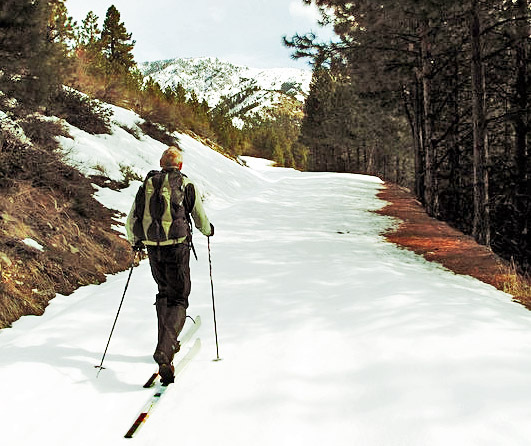 For a different percentage, maybe roads are just too mellow so we don’t see the true backcountry skier using them. “Snowmobiles” are the next scapegoat. Part of the decreased use pertains to the way snowmobiles have supplanted other users on snowed-over roads. Between the noise, smell, and speed of snowmobiles, it’s just not fun to ski road systems that see heavy snowmobile use. Many Nordic skiers don’t know which road systems escape snowmobile use and, rather than risk a lousy experience, have simply migrated to managed Nordic trail systems. The conversation stalls as both Matt and I ponder the situation. On this March Sunday the Preston Creek Road, a road system that gets some snowmobile use in mid-winter when the snow level is lower, does not have a single machine on it. In fact, the lack of tracks indicates it’s been well over a week since motors roamed this road. With our wives chatting amiably about family issues, we ski 5.5 miles, gaining elevation every step of the way. The mountains are soaking in the warmth of spring sunshine when we reach a viewpoint high on the divide between Brennegan and Preston creeks. It’s a lofty place to enjoy the fruits of our efforts and to call the uphill quits. On the divide between Brennegan and Preston creeks. We’ve ended up back at the start of our conversation. Gliding downhill with corn snow underfoot, sun on the shoulders, and views in the face. What kind of crazy person wouldn’t love this skiing? There are kernels of truth here. In my own case, my first love is finding my way around wilder terrain on backcountry gear. Yet today’s trip, even if it doesn’t form the apex of my pyramid, is high on the pleasure scale. This has been a fun day with my wife who used to backcountry ski more adventurous with me but gave that up 20 years ago. It’s been a great day with Matt’s wife who used to downhill ski more but who gave that up four or five years ago. It seems that serious skiers tend to specialize, but the world is full of casual winter recreationalists who would love what we’re skiing today. Rather than specialization killing this type of cross-country skiing, it seems like road skiing has simply been overlooked in recent years. I’m back on Matt’s earlier comments about lack of advocates. People aren’t skiing road systems like they did 25 years ago because few people talk about this. The buzz has moved elsewhere. Maybe we just need to remind the outdoor crowd about the fun factor associated with this old-school form of cross-country skiing. 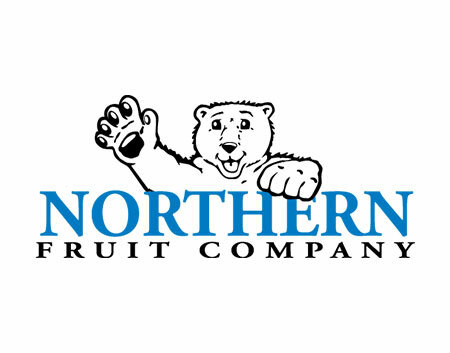 By promoting it, telling new skiers about it, and informing old skiers about new road systems they should sample, maybe we can ski back to the future. Or would this be a case of skiing forward to the past? Who knows… suffice it to say that if you haven’t been skiing our forest roads of late, you’re missing out. 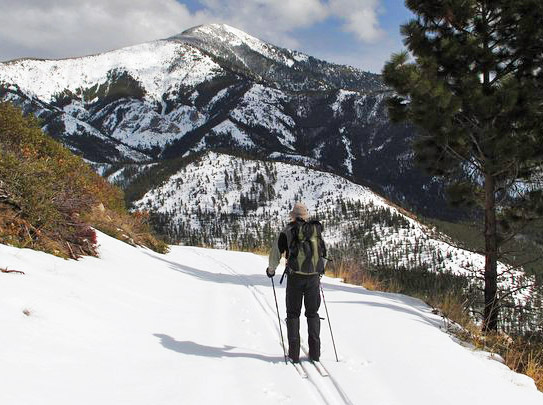 The Preston Creek roads add another excellent cross-country skiing option to our regional quiver of forest road systems to explore (see the Nordic guidebook for over a dozen other local road systems to ski). Miles upon miles of roads here offer solitude and spectacular views out over the precipitous peaks flanking the Entiat River Valley. Fitness. 1 to 3 (beginner to advanced). The network or interconnected roads here can accommodate all fitness levels. Skill. 1+ to 2 (advanced beginner to intermediate). The start of this tour climbs the steepest and, in icy conditions, could be treacherous on lightweight equipment. 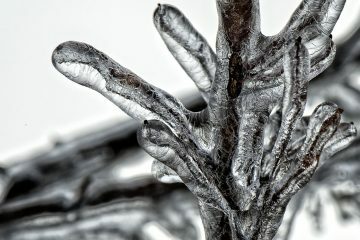 Using skinny skins for the descent is recommended in icy conditions. Naturally you can also walk down steeper sections of the road if icy conditions make the descent too difficult. Trip Instructions. There are a variety of tour options here and they’re all scenic. 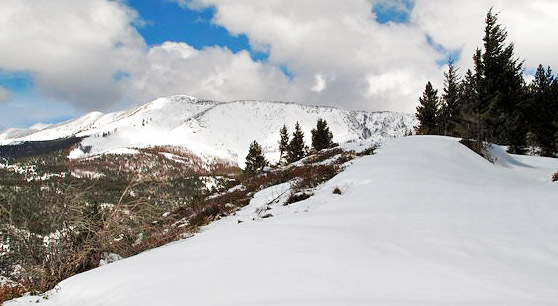 Start by skiing 2 miles up the road to a signed intersection at an elevation of 2,760 feet. If you branch left, make a gently climbing contour to the west and, after a mile, reach a shoulder with nice views out over the Entiat and down on Brennegan Creek. This road keeps traversing into Brennegan Creek and continues on for many miles. We’ve only listed this short side trip. If you continue on straight, the road contours above Preston Creek, eventually crosses the creek, and comes to another intersection after a mile. If you stay to the right here, you’ll reach a pretty saddle above the South Fork of Preston Creek after 2.5 miles (the road keeps going for many miles if you want to carry on). If you branch to the left at the intersection noted above, in 2.5 miles you’ll reach a saddle on the high divide between Brennegan and Preston creeks. This saddle makes a good turn-around point but, frankly, it’s worth persevering and pushing on another 1.4 miles until the road ends because the road follows a high divide with spectacular views in all directions. Map. See our topographic map of the area below. 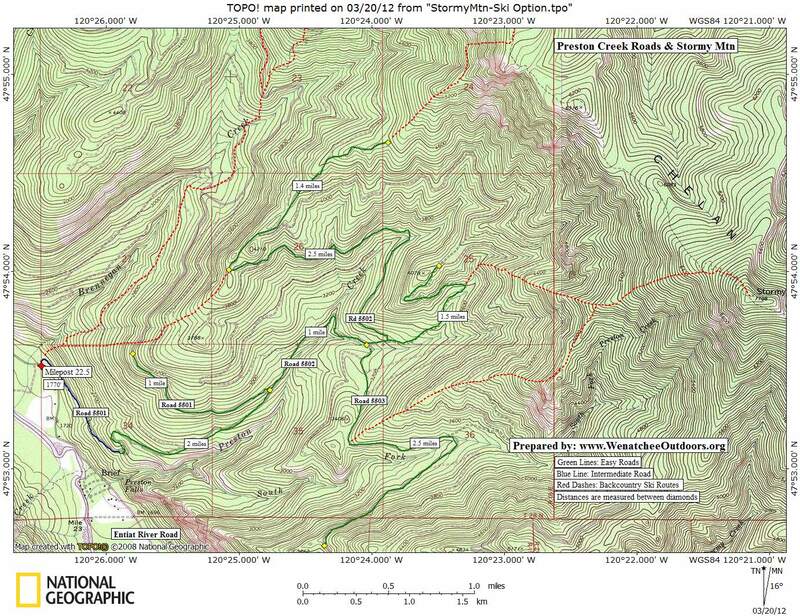 The topo map also shows some routes backcountry skiers can use to ski Stormy Mountain. Equipment. No-wax cross-country skis are recommended. 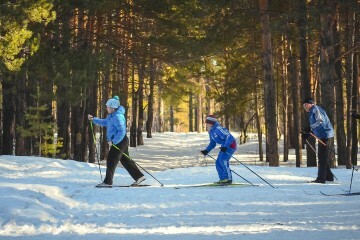 Strong intermediate and advanced Nordic skiers could handle the road in most snow conditions with general touring skis (roughly 50mm wide at the waist and lacking metal edges). Such skiers should still have skinny skins along to contend with icy conditions. Most skiers will be better able to contend with the wide array of snow conditions they might encounter on such a tour if they use metal-edged cross-country skis that are 60 to 70mm wide at the waist, are outfitted with a 3-pin binding, and that are mated with a leather boot designed to telemark down easy terrain. Carrying skinny skins (1” to 1.5” wide) is highly recommended because no-wax skis don’t always climb well in icy or very dry snows. 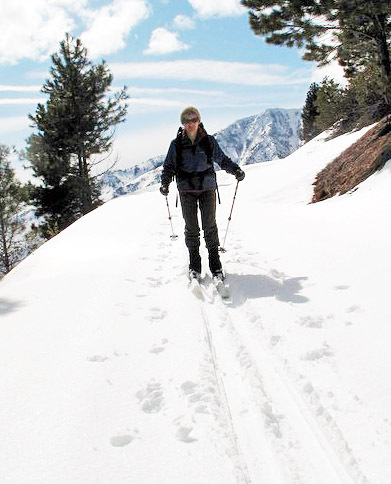 Skins can also be a life saver when descending icy or crusty snow conditions. If you’re unsure about how to get or make appropriate skins for these skis, see this article. Season: In mid-winter (early January to mid-February), the roads here do get used by snowmobiles. Skiers we know who have used the roads at these times have reported that the motorized use is usually not heavy, but that you should expect to encounter some machines. In late winter (latish February and March) the majority of snowmobilers are heading up to higher trailheads and the roads here tend to be ignored. Leave It Better Than You found It. This should be every user’s goal. Don’t litter and pick up trash found along the way.